This is a true Thai yellow curry paste made the authentic way, and if you've had dishes including more of an imitation yellow curry, you will definitely taste the difference. Made with yellow chilies, lemongrass, galangal, fish sauce, and spices including turmeric, this recipe is as real as it gets. 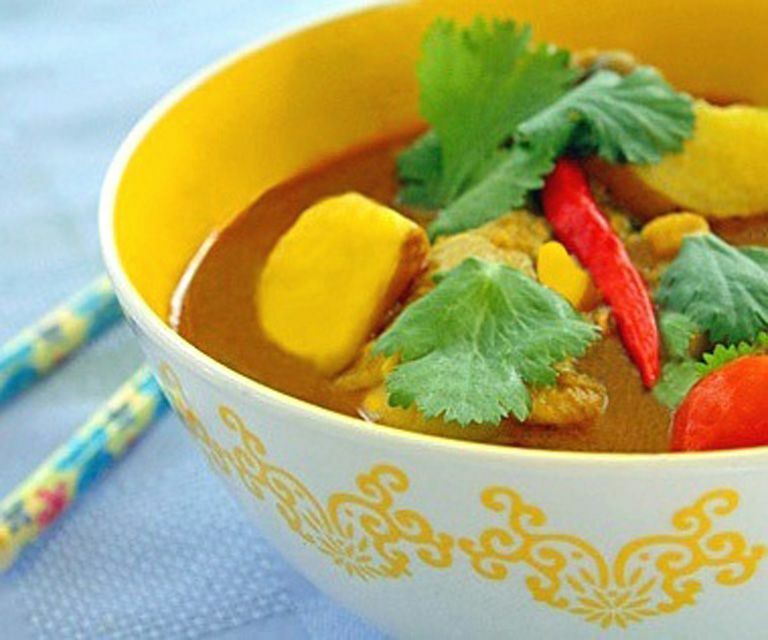 Yellow curry paste is so versatile, you'll want to try it with a variety of meat, seafood, vegetable, noodle, and even soup recipes. This fragrant yellow curry paste makes Thai food easy to cook, and quick as well, especially if you make the paste ahead of time. It's also super-healthy—you can tell by the deep yellow color of the turmeric, an amazing antioxidant and cancer fighter. Use it right away in a delicious Thai curry, or store in the refrigerator or freezer to use anytime. Place all ingredients, using just 3 ounces of coconut milk, in a food processor or blender. Add more coconut milk as needed to blend ingredients into a smooth paste or sauce. Process well. Use in your favorite curry dish or store for later use. Store in an airtight container in the refrigerator for up to 2 weeks (or longer). Some of the ingredients in this recipe are specifically Asian; if you don't have a store that sells Thai ingredients, don't worry—there are a few substitutions you can make. If you can't find fresh lemongrass, use 2 to 3 tablespoons of frozen prepared lemongrass. You can use red chilis instead of yellow, or 1/2 to 1 teaspoon dried crushed chili. Instead of shallots, substitute 1/3 cup chopped onion. Ginger works well in place of galangal. If you don't have shrimp paste, use an additional tablespoon of fish sauce, and black pepper may replaced for the white. Whether you are using right away or grabbing from the freezer, this yellow curry paste is simple to turn into a delicious curry. Place paste in a wok with some vegetable oil. Stir-fry until fragrant (about 1 minute), then add 1 to 3 cups chicken or vegetable stock, plus your ingredients—chicken and potatoes or other meats, seafood, tofu, wheat gluten, and/or vegetables. Add a little more coconut milk for more sauce, reserving a bit to add to each serving at the end. Always taste test for salt and sourness/sweetness after a curry is done cooking, adding more fish sauce or salt if not salty enough, and more sugar if too sour. If too salty, add a little more lime juice. Add more coconut milk for a creamier, richer sauce. Before serving, top with fresh coriander or basil.